1.Rare case of fungal osteomyelitis of terminal phalanx of second toe? 2.Presentation and management of isolated fungal osteomyelitis? 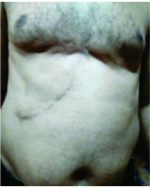 Case Report | Volume 3 | Issue 2 | JOCR April – June 2013 | Page 29-31 | Pattanashetty OB, Dayanand BB, Bhavi SB, Bami M.
Department of Orthopedics, Shri B M Patil Medical college, B.L.D.E University, Bijapur, India. Introduction: Fungal osteomyelitis is an uncommon diseases and generally present in an indolent fashion. Isolated bone affection due to fungi are rare and we present one such case with fungal osteomyelitis of terminal phalanx of second toe. Case Report: We present a rare case of fungal osteomyelitis of right second toe in a 30 year old Indian female who presented with swelling of 8 months duration. Diagnosis was based on the histo-pathological report and culture showing Aspergillus growth. The patient was treated with surgical debridement and amphotericin-B was given for 6 weeks after debridement. There was no recurrence one year post surgery. Conclusion: Isolated Aspergillus osteomyelitis of the bone are very rare and mostly seen in immunocompromised patients and larger bones like spine, femur and tibia. Treatment with wound debridement and subsequently followed up with a course of Amphotericin-B for 6 weeks provided good results. There was no recurrence noted at 1 year follow up. Fungi should be kept in mind for differential diagnosis of osteomyelitis and culture should be appropriately ordered.